Alanis Morissette Re-Did Her Song "Ironic"
Alanis Morisette took the music industry by storm in the mid-90s. Many of her tracks became huge hits, but probably one of her most notable songs was “Ironic”. Not only did the tune crush the top lists in multiple countries, but the music video was nominated for a Grammy. The entire world seemed to fall in love with this little diddy. However, for many of us, we don’t care–we love that song and always will! Fortunately, we all had the opportunity to hear the song again recently. However, there were a few minor adjustments made to make the song a little more cohesive to current-day events. Alanis and “The Late Late Show” James Corden performed an updated version that was too perfect for words. Not only does the song addresses social stigmas, iPhones, Twitter, and many other tongue-in-cheek references to how our society operates these days, but =there’s also a little nod to all the haters out there with the line, “It’s singing ‘Ironic’ with no ironies”. 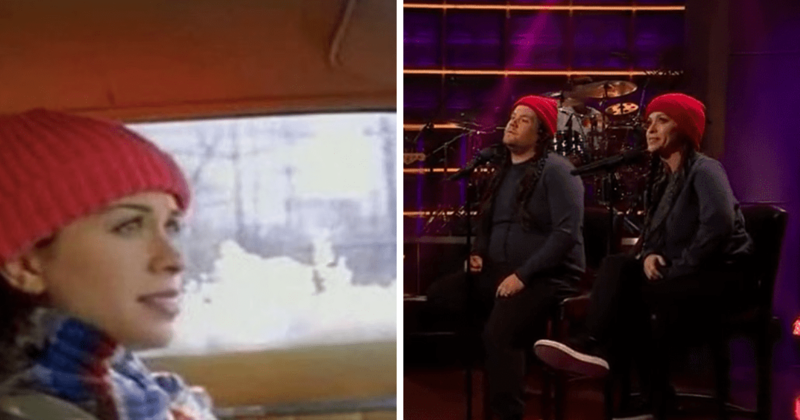 Let’s also pay homage to the fact that James Corden plays the part of a pretty good Alanis in that hat and wig. The crowd absolutely lost it when he first walked out. Looking good, James! Not only does Alanis have a great sense of humor, but let’s take a minute to appreciate that the woman hasn’t aged in twenty years! This was a light-hearted performance that you can’t help but smile about. It’s still just as catchy as ever! Don’t forget to check out the video below to see this hilarious performance for yourself. Sheree McDonald is a contributor at Shareably.